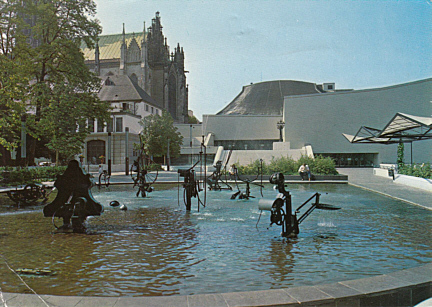 Built 1968-1975 by Schwarz & Gutmann (Frank Gloor, Rolf Gutmann, Hans Schüpbach and Felix Schwarz), located next to the former Stadttheater (demolished 6 Aug 1975). Opened 3 Oct 1975 as "Stadttheater". The complex includes two theatre halls (ca. 1000 seats and 320 seats). 1988 renamed "Theater Basel". Reverse Text: "Basel - Bâle, Tinguely-Brunnen beim Stadttheater"